United Way of Washtenaw County's goal is to help working families and individuals pave a path to financial independence. VITA utilizes a team of dedicated and professional volunteers to provide FREE tax preparation. 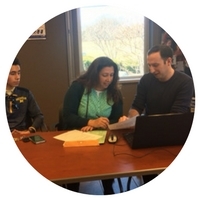 Volunteer tax preparers work one-one-one with individuals and families to navigate tax returns, offer financial tips and seek out all available tax credits, such as the Earned Income Tax Credit (EITC). File your taxes for free in the convenience of your own home using MyFreeTaxes.com. Sponsored by United Way and powered by H&R Block, MyFreetaxes.com allows individuals or couples filing jointly who make up $62,000 a year to file their taxes on-line for free. If you still have questions call 1-855-MY-TX-HELP (1-855-698-9435). Weekly Spending Tracker Tracking spending is an important step in preparing a budget. Budget Worksheet Tool Setting and following a budget is key to meeting financial goals.